I am honored to appear on the Experience Pros Radio Show! I'll be discussing several estate planning questions. You can find the show here: On the radio dial, it's AM 560. I hope you'll join the show, listen in and even call in and participate! Estate planning is a catch all phrase that refers to legal arrangements you can make, either through legal documents such as a Will, or to contract arrangements you can make such as beneficiary designations on accounts or property. The planning portion of the phrase refers to a thoughtful analysis of your situation, needs, assets and goals to develop and implement a plan that is customized for you that involves both the legal and title arrangements. There is no such thing as a "one size fits all" estate plan. Everyone's situation is different making their estate plan different as well. This is one of the most frequent questions I hear. The answer is, "it depends". Now, that's not a typical lawyer answer at all. It really does depend and it requires what I refer to in the first answer above: a thoughtful analysis of your situation, needs, assets and goals. Without this (we call this an estate planning assessment)it is not possible to provide each person with proper answer. 1) Do you have minor children or a disabled child? 2) Do you care who makes decisions for you if you are incapacitated or controls your estate if you die? 3) Do you care where your assets go if you died suddenly in an accident? 4) Do have life insurance and other investments? 5) Is your property in more than state, or does it consist of operating businesses or farm or ranch property? 6) Are you concerned about keeping assets and estate private? 7) Is your estate near or over the estate tax exemption? 8) Are you concerned with protecting family property from future creditors? There are other circumstances any client may have that would give rise to a need for estate planning, but a good place to start is those 8 questions. If you can answer any of them with a "yes" then you should schedule an estate planning assessment for yourself. 3. Since the estate tax exemption is so high, I don't need to do anything right? Unfortunately, this is wrong. The level of the estate tax exemption keeps changing as Congress has decided (for whatever reason) to use the estate tax exemption as part of a political game. In fact, the current exemption may only be in place for 2011 as a new proposal to decrease it starting in 2012 was introduced just last week in Congress. Relying on the government or Congress to do your estate plan for you is a risky proposition and we don't recommend it to any clients. A good rule of thumb to remember is: what the Congress gives one year can be taken away the next. With the frequency of changes to the estate tax laws coming from Washington, we recommend that clients focus on estate planning arrangements that will be workable for their family regardless of that Congress does. This is not always easy to accomplish for all clients and does require that thoughtful analysis I refer to above. If you have a question that you would like our input on, don't hesitate to give me a call at 303-730-7100, send me an email, or just make a comment here. I hope you join our conversation and we look forward to hearing from you. Thank you for your interest. A Gift For Thanksgiving? How About the Gift of Being Current? As an estate planning attorney, as you might guess, I think a lot about estate planning. Recently, two experiences with clients reminded me of how important your estate plan is to protecting you and your family. The experiences of those two families is about the importance of having a current plan rather than one that is old and out of date. The first case involved a client who suffered an illness that left them incapacitated. The issue we faced is that the client's documents did not have current HIPAA language. This means that having the right family members with access to the client's doctors took some work. First lesson: make sure you have current Powers of Attorney that contain the appropriate HIPAA provisions so that the family members you want can speak to your medical providers should you suffer an incapacity. The second case was more problematic. This client had not updated their Will concerning who would be the Personal Representative (that's the Executor in Colorado). When the client died two months ago, the family was not pleased that someone no longer involved with this client was named as the PR. We were able to solve this sticky problem with a series of meetings and negotiations. Lesson two: keep your Will or estate plan up to date. What started me thinking about this is the holiday season. The holidays are when most people think the most about family (except some the stores that are forcing employees to work on Thanksgiving; a subject for a different article)and is always my busiest time of the year. So when you are thinking about your family this Thanksgiving, you might also think about whether your documents, Powers of Attorney, Will or estate plan are up to date and current. If not, how about that for a way to remember your family? Protect them and yourself with current documents. And of course, if you don't have these documents yet, the holidays are probably the best time to get started. What do you think? Please join our conversation with your comments, thoughts or questions. As always, thank you for your interest. The phrase estate planning can be intimidating to some, but getting started is easier than you may think. Are you put off when you hear about estate planning? It's in the news, on TV and all over the internet. Many people gt intimidated when they hear those words, but there's no reason to fear or avoid getting started with your estate plan. Let's discuss just how easy it can be to get started. First, the words, estate planning. Those words mean something different to everyone, but all they really mean is creating certain arrangements for your assets, property, insurance, IRA, etc. and for some creating a Will, Powers of Attorney and a Living Will. For others it can also involve creating trusts and focusing on estate tax planning. In fact, you may have already done some and you don't remember. For example, if you have some insurance, you probably named a beneficiary. Perhaps the same with an IRA. Those beneficiary designations represent a form of estate planning. Perhaps you got a Will from military service, or some other source. Again, you have done some estate planning. So, what about getting started and why would I suggest it's easy? Well, if you want to have a simple plan, then just make sure your beneficiary designations say what you want, especially if you haven't looked at them in a while. Second, in a State like Colorado, you can use POD (Pay on Death) or TOD (Transfer on Death) beneficiary designations to direct bank accounts or brokerage accounts to the beneficiaries you want. This represents a probate-free transfer of the bank or brokerage account to your intended beneficiary and you don't need a Will to accomplish this. Moving to the next step could involve protecting yourself with Durable Powers of Attorney and considering a Will. If your net worth is significant, you might also look at estate tax issues. So, when you approach it from this direction, estate planning can be simple and not intimidating. What do you think? Please join our conversation and leave a comment or feel free to ask any questions that you may have. You can also call our office or send me an email, I answer them all. In our continuing and unfortunately never-ending mission to expose scams, here's a new one called the Fake Referral. I found out about this scam this morning and if you know about it, you can protect ;yourself. Scammers and criminals are getting more and more clever in their efforts to steal your money. Here's the latest one, the Fake Referral Scam. Here's how the Fake Referral Scam works: Someone claiming to be a financial planner etc. calls you and says "so and so referred me to you". Sounds legit, right? Well it isn't because that is not how professionals make referrals. Don't fall for the Fake Referral Scam. Professionals, like me, make referrals differently. If a client asks me to refer them to an accountant for example, I will provide my client with several names of accountants that I trust. I will never call the accountant and give them a client's name and number. 1. Get referrals from the referring professional directly. 2. If you get a call like this, either hang up, or call the professional who supposedly has made the referral and ask if they did so. 3. Write down the callers name and phone number and consider referring the caller to the proper authorities. If you follow these three suggestions, you can avoid this latest scam, the Fake Referral Scam. Let me know what you think and please join our conversation. Thank you as always for your interest. Here are six sure fire ways to make sure your Will is up to date and current. I am often asked how someone can make sure about this. Let's discuss how you can tell if it's time for you to get your Will and estate plan reviewed. If your Will or estate plan falls into any of the categories below, it is OUT OF DATE and requires immediate attention. 1. You signed your Will in 2009 or earlier. If your Will or estate plan is from 2009 or earlier, it is out of date and probably obsolete. Many things have changed since 2009, including dramatically different laws and rules concerning estate taxes. 2. You don't have Durable Powers of Attorney than name a HIPAA Personal Representative. With the introduction of patient privacy laws under HIPAA several years ago, it is vital that your Powers of Attorney comply with these federal rules. Failure to do so could result in many problems for your family and decision makers if you are sick or injured. 3. You have moved to a state different from where your Will was created. Since the laws vary from state to state, when you move to a new state, it is always advised to have your existing Will and other documents reviewed. This guidance also applies to your titles and beneficiary designations. Life brings changes, some good, some not. These changes must be considered to make sure your Will and estate plan remains appropriate for you. If life has brought you a significant event, it's time to get your Will and estate plan reviewed. 5. You have an A-B Trust, or any any other kind of estate plan that mentions the marital deduction and estate tax exemption. These kind of Wills and estate plans are now obsolete and hazardous to your wealth. If you don't know how the estate tax changes of 2010 impact your plan, and you don't amend your plan accordingly, your family is at risk. 6. You have a fill-in-the-blank form or Will from any internet site. It is a certainty that your Will or estate plan is out of date and obsolete if you have one of these. Not only are these forms dangerous for your family (See, the several articles below on internet Wills), they are even illegal in some states. If you have these kind of documents, get them reviewed and replaced immediately to protect yourself and family. There are many other methods we use to determine the soundness of your Will and estate plan. So we don't stop with only these six. These six ways are a good way for you to start and I encourage you to see if any of these apply to you. Let me know your thoughts and comments and any question is welcome. Thank you for your interest. Let me know your thoughts or if you have any questions. In reviewing my last few entries here, I noticed that the topics were all of interest to me. As I do periodically, it's now your turn. What would you like to have discussed here next? Remember, our focus is estate planning; estate taxes and estates, so let's try and stay in those areas and away from the usual minefields of politics, religion and Lady Gaga. To start things off, I will say that it was an honor for me to be a presenter along with such luminaries as Brad Friedman, Jim Thomas and Susan Gindin today at a continuing legal education program at CLE in Colorado called, Social Media for Lawyers, by Lawyers. As we learned from Jim today, there really funny lawyers! So now it's your turn. What estate planning, or estate tax topic would you like to discuss next? I'm looking forward to hearing from you. Is Our Legislative Process Corrupt? Maybe. I commented below on a story in the January 25th edition of the Wall Street Journal. This story alarmed me because it suggests that our legislative process may be corrupt. What this involved is lobbying attempts by some Hedge Fund operators to have Congress crack down on for-profit colleges. At the same time these hedge fund guys were pushing for Congress to act, they were shorting the stock of several of these colleges. My point is this: there should be complete transparency in our legislative process. I have no problem with these people lobbying for Congressional action. My argument is their doing so without telling Congress that they have shorted or are shorting the stock in these colleges. You see, if Congress does act, their short bet that the stock would go down would be correct and the hedge funds would make millions. So if you are going to lobby Congress to pass legislation, then at least be honest and up front about why you are there. We Have a New Tax Law and Called the Above Name! As I write this, it's January 20, 2011. We got our new tax law back in December of 2010. I am writing this because this week alone, I have met with over 10 people who were not aware that this new tax law existed. Strange? Perhaps. But tax lawyers like myself do not always remember that people who do not focus on estate taxes do not pay attention to changes in the estate tax laws. Remarkable, but true. I have written before about some of the details of this new tax law. The estate tax parts of this new law are retroactive to January 1, 2010! I will not repeat those descriptions in this article. People Are Unaware of the New Tax Law! Since the first of the year, I have met with several people who expressed surprise that a new tax bill had been passed and signed by the President. This has amazed me because of how much my firm has tried to educate our clients and the public about what is going on with estate tax laws. However, the truth is that most people do not pay attention to these tax law changes. So, what should you do about all this? First, schedule a meeting to meet with your estate planning attorney and learn how and if these changes apply to you. 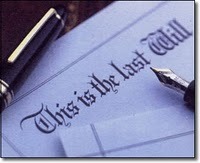 Second, if you don't have a Will or estate plan yet, make 2011 your year to get one. You can review all of my earlier articles about why this is the best thing you could do for yourself and your family in 2011. Third, if you don't want to stay current on what is happening in the tax world, follow our blog here. Come visit here often and check in from time to time. Who knows, it just might be fun and even (gasp) educational. Let me know if you found this article helpful and if you have any questions. Thank you. Top 10 Worst Estate Planning Mistakes! This is just one list of the worst estate planning mistakes. There are dozens of mistakes that people make with their estate planning. This is my list of the 10 worst mistakes I see in my practice. Don't be fooled by how common or ordinary these mistakes seem. There very ordinariness is what makes them so dangerous to the family. This mistake should really need no explanation. It is the worst mistake of all because it leaves your family and you completely exposed. You are reliant on the legal system of your State to take care of your property; your spouse and your children. Generally, this is not the preferred way to take care of your loved ones. This is a common mistake that usually leads to the first mistake. There are several reasons that people believe that estate planning is not necessary. They think they don't have enough property or they don't have family that depends on them. These factors could be present, however, the truth is that there are very few people who don't need some kind of planning. Even if you have no property ( a rare circumstance) or if you have no family, you would still want to protect yourself from disability. Children and their protection is a primary goal of estate planning. This is crucial if your children are young or disabled. A proper estate plan will allow your kids to be raised by those you trust, in the manner you support and the financial future of your kids to be protected. Many people who don't pursue an estate plan fail to do so because they think they don't have a large enough estate. Unfortunately, approximately 96% of all clients don't know how to calculate their estate. Invariably, people forget something that creates estate value when they tell me how much they are worth. They routinely forget life insurance (See, the next mistake! ), pension plans and other assets. When you do your estate plan, learning how to correctly calculate your estate is one of the initial steps. As just referred to, many people fail to include their life insurance when considering their estate size. They do this because people remember that life insurance is income tax free. However, it is not estate tax free and if you own or control the insurance policy, it is part of your estate. Insurance proceeds alone can be significant and if not planned for, can create havoc in your plan. Most experts (and I) agree that online or fill-in-the-blank forms are an inappropriate estate planning solution. Why? They don't work, people fill them out incorrectly and they create numerous unintended consequences. 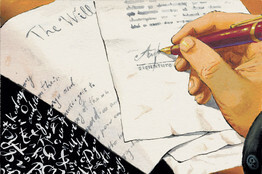 A Will, while important, is not an estate plan. The Will is just one component to every estate plan. The plan should also include, at a minimum, Durable Powers of Attorney, Living Wills, and tax and probate analysis. Many people have benefits from work, insurance policies and IRA's. All your beneficary designations need to be coordinated with your estate plan. Failing to do so will mean the plan will fail. Almost everything we do has tax consequences, including our estate planning. Congress has changed our estate tax rules repeatedly over the past several years and more changes are coming. It is vital to the integrity of your plan to consider how these tax rules work and how changes to those rules impact yourself, your family and your plan. Even though I am a fan of the movie, My Cousin Vinnie, the truth is your cousin, uncle, brother, sister or neighbor cannot help you with your estate plan. Unless they are a full time estate planning specialist, you should stay away from their amateur estate planning approaches and ideas. I can't tell you how many times we have had to re-do or clean up estate planning documents that came from a non-expert source. I recommend to all clients to view their estate plan like their medical care. They would not let their cousin perform surgery on them so don't let that same cousin try and do their estate plan. Like surgery, estate planning is best done by experts. That's my list of the top 10 worst estate planning mistakes. Do you have your own? What do you think of this list? Please comment on your thoughts and experiences. Thank you. Right before the end of the year, Congress passed and the President signed a major new tax law. What does it mean for you? Our new tax law is far reaching and will affect every aspect of your life. Over the next few days, I'll have several articles for you about different features of this new law. Before getting into details, let's just list several features of the new law. 1. The Bush era income tax cuts have been extended. 2. The estate tax exemption becomes $5 million retroactive to 1/1/2010. 3. The carry-over basis rules that were in effect for 2010 estates with a 0 estate tax are now optional via election for 2010 estates. 4. The new $5 million estate tax exemption means that old style A-B or Marital Deduction trusts are no longer viable and will create major problems for your family. 5. Unused exemption from the first spouse's death now can be used at the second spouse's death, but require the filings of estate tax returns with the IRS. That's just a quick introduction to the new law. Many more details will follow.